So...I made an apple pie! 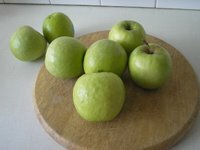 Now, at home in the U.S., I would use Granny Smith apples for baking. Easily found here in Ireland, but Bramley apples are the "baking apples" here so I learned. I shared the pie with some friends, one of whom was very vocal about how only Bramley apples are used for cooking here and Granny Smiths are considered "eating apples". My theory: they're all going to be eaten at some point! This pie turned out wonderfully - I reduced the sugar by a half a cup however as I thought two cups was a little over the top! Also, I used lemon juice to prevent the apples from browning (after I had cut them) - an old trick - but actually, I could taste a hint of lemon in the pie even after baking and it gave a little lift. In a medium-mixing bowl cut the shortening and salt into the flour by hand or with a pastry blender hands until it's the texture of corn meal. Sprinkle 1 tablespoon of ice water over the mixture and mix just until the dough is moistened. Repeat by adding 6 to 8 tablespoons water (one at a time) until all the dough is just moist. Take care not to over mix. Preheat the oven to 375 degrees F. Divide the dough in half and roll into a ball. Roll 1 ball into a circle to fit a 9 to 10-inch pie plate. To transfer the pastry to the pie plate, wrap it around a rolling pin and ease it into the pie plate. Be careful not to stretch the pastry. Trim it even with the edges of the pie plate. Add the apple filling. 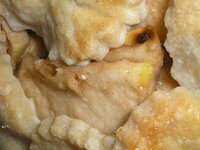 Trim off 1-inch beyond the edge of the pie plate. Crimp the edges as desired. Cut slits to allow steam to escape when baking. Sprinkle a little sugar and cinnamon over the pie. Cover the edges with foil to prevent over browning. Bake for 25 minutes. Remove the foil and bake for another 20 to 25 minutes, or until it is golden brown. Serve warm with vanilla ice cream. In a medium bowl combine the apples, with the brown and white sugar. Add flour, cinnamon and continue mixing until they are well coated.